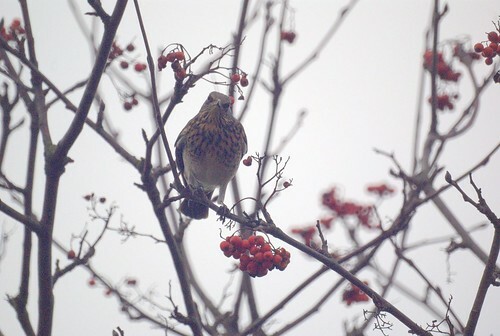 Nature Magnified: The Fieldfares are here. My camera was in my bag and I cautiously reached back and retrieved it. 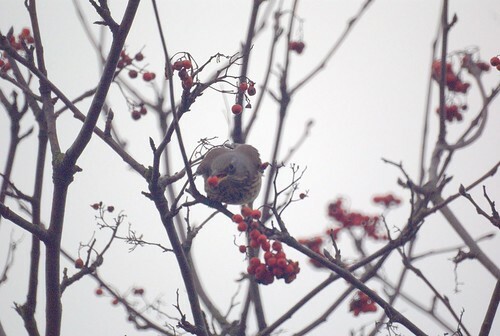 The bird wasn’t too bothered and was more intent on eating berries….as a result I got these pictures. 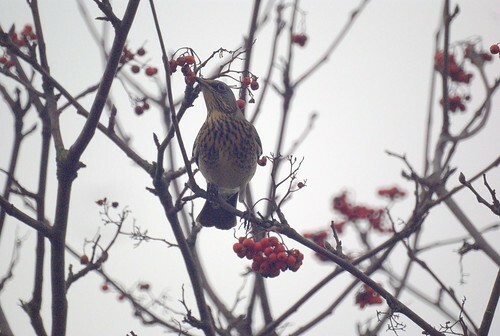 The fieldfare is a winter visitor to the UK, and is a scarce breeder. It usually inhabits forests and woodlands but also can be seen in towns. This one that I saw was by the side of a busy road. 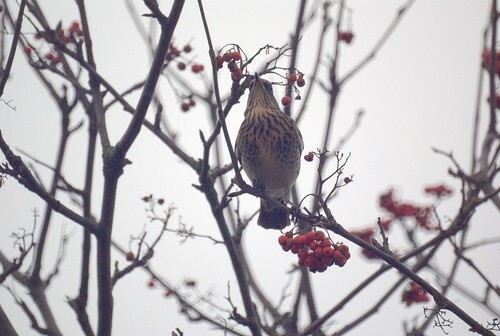 Fieldfares feed on small invertebrates and fruits. 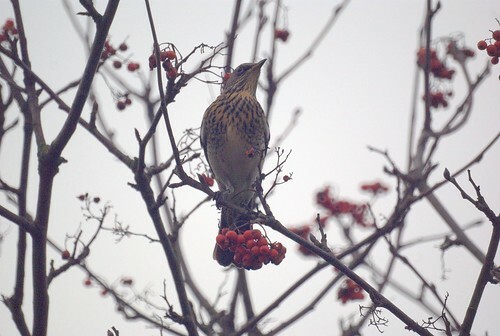 An interesting titbit about fieldfares is the way they defend their nests and eggs against egg thieves. It seems they bombard egg thieves with their faeces! 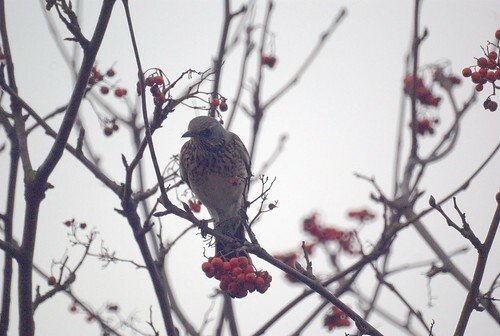 …and for this reason, smaller birds often choose to nest near a fieldfare’s nest.The fieldfares generally nest communally, so I wouldn’t want to be anywhere near an annoyed nesting bird! 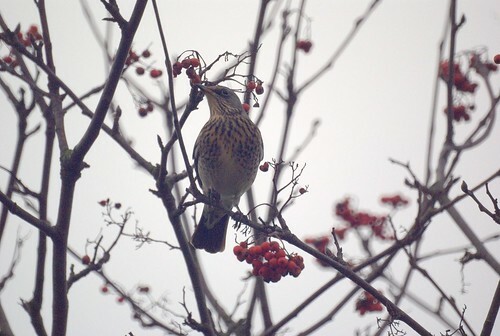 In winter the fieldfares form large flocks and their preferred feed is invertebrates. To identify these birds watch out for the bluish grey head and light brown chest with spots, and of course the unmistakable noisy “tchak-tchak” call. 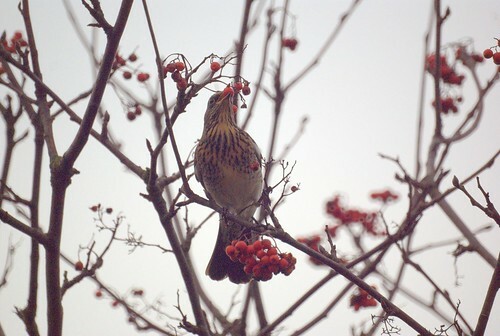 I always enjoy seeing the birds feasting on berries. Some nice photos and info. A very interesting series of photos and I enjoyed the audio of the call. 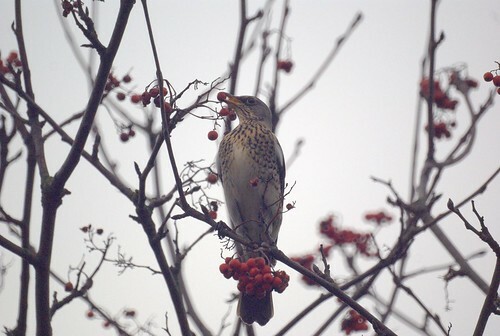 It is interesting to see this as a series, you can really see the watchful attitude of the bird as it noshes on the berries. Great photos and theanks for the call. 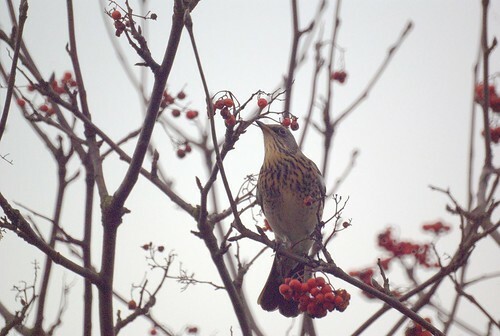 A very pretty bird with the spotted throat and brest though not melodious. Great series of shots, Tom! It's also nice to hear what they sound like. It's always fun for me to witness and document and study a bird while it is eating and manuevoring through its habitat. Nicely experienced.